American Samoa Community College (ASCC) Samoan Studies Institute (SSI) Director Okenaisa Fauolo-Manila and four Samoan Studies majors recently returned from Washington, DC where they participated in two events centered on the indigenous peoples of America. From July 18th to the 20th the group took part in the Living Earth Festival sponsored by the National Museum of the American Indian, then participated in the First Stewards symposium from July 21st to 23rd. Both events took place in Washington, DC. 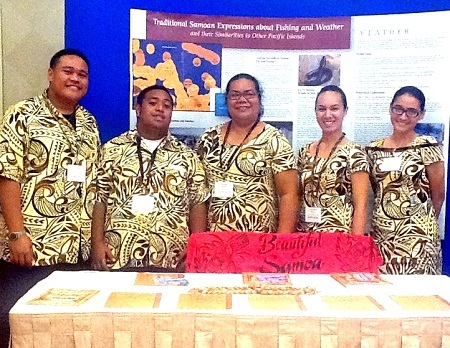 With travel resource assistance from the Western Pacific Fishery Management Council (WPFMC) in Hawaii, at both events Samoan Studies majors Anna Afoa, Toni-Marie Hollister, Jerome Matagi and Faleosalafai Tipa shared their research researched on traditional Samoan expressions about fishing and climate, and the similarities these expressions share with other Pacific island cultures such as Tokelau, Fiji, New Zealand and Hawaii. The students created a poster based on their research, which they displayed at both events, with at least one of them always on hand to answer questions. They also shared Samoan song and dance during the Cultural Reception on the first evening of the First Stewards event. Fauolo-Manila expressed her thanks to Ms. Kitty Simonds, Executive Director of the WPFMC and also Vice-Chair of First Stewards, and to ASCC President Dr. Seth Galea’i for their assistance in making the trip possible. For more information on the SSI, visit the ASCC website at: www.amsamoa.edu.